Filmmaker: Elizabeth Woodman Wright. Transfer Note: Two sequences copied at 19 frames per second from a 16mm print preserved by Northeast Historic Film. New Music: Martin Marks, piano; George Ruckert, fiddle. Running Time: 12 minutes. While professional cinematography was becoming a male enclave, magazine ads for amateur movie cameras in the 1920s were promoting filmmaking for women through images of women filming their families and nature. If those were limitations, Elizabeth Woodman Wright (1885–1961) nonetheless filmed domestic rural life with a grace rare among even professional cameramen. In 1928, Wright bought a 16mm Kodak movie camera and over the next six years sketched her family’s summer farm with the eye of a landscape artist. 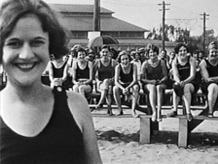 The two sequences reproduced here come from the same reel, probably taken in the summer of 1930. The flag flapping briskly in the first shot underscores the Wrights’ name for their farm, “Windy Ledge,” located inland in southwestern Maine, in the town of Paris. The scenes of clearing fields and woods, harvesting hay with horse-powered machinery, and shingling the barn capture everyday work and also a sense of play from the children who assist. For this gentle and touching amateur documentary, I relied almost entirely on traditional songs and dances, many widely known to residents of Maine. The exceptions come at the beginning and end: For the flag raising and lowering it seemed natural to play the customary bugle call “To the Colors.” The subsequent music commences with Maine’s state song—“State of Maine,” by Roger Vinton Snow—followed by “The Dearest Spot on Earth” (W.T. Wrighton) and moves to several other poignant tunes, all heard in passing, to sustain the mood. The films of Elizabeth Woodman Wright were preserved by Northeast Historic Film through Treasures of American Film Archives, a millenium project organized by the NFPF and supported by the National Endowment for the Arts. Northeast Historic Film distributes moving image media from New England, including many early films from its collection. Among available titles are the 1930 logging film From Stump to Ship, a 1920 record of Maine’s northernmost region, Aroostook County, and pre-1920 shorts compiled as Earliest Maine Films. The catalog, ordering, and membership information are online at the NHF website: www.oldfilm.org.